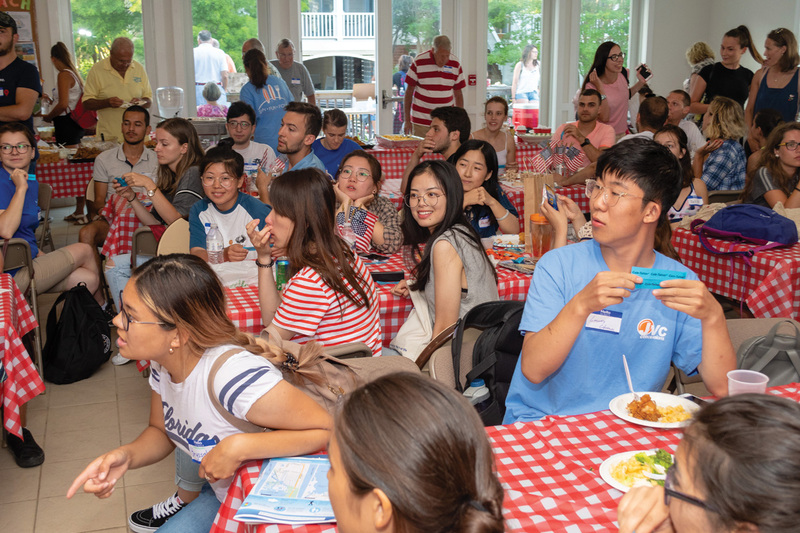 International student workers gather with locals and enjoy food and conversation at St. Martha’s Episcopal Church in Bethany Beach. From left: Uc Tugberk Toy (Romania), Mihai Iorga (Romania), Ioana Azimioara (Romania), Trooper Irina Celpan (Romania), Semih Albayrak (Turkey), Berkay Guner. 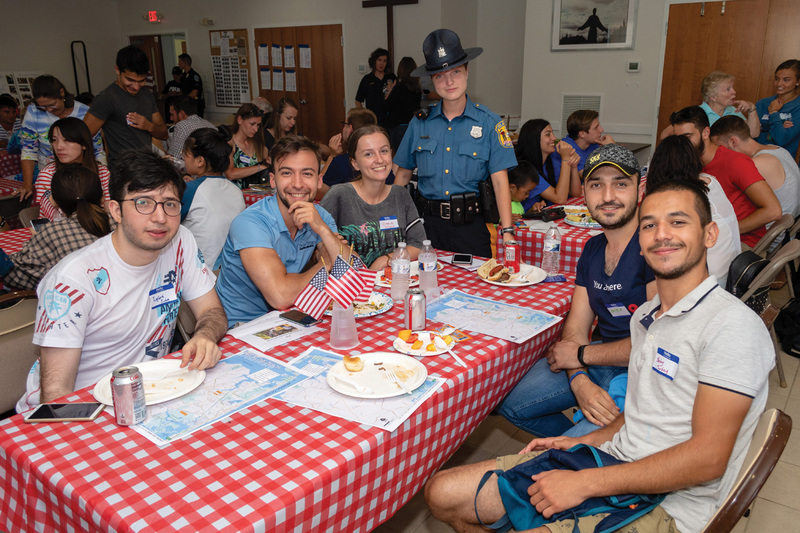 Trooper Celpan was an international student worker not so long ago, and is now at Troop 4 in Georgetown. rom left, Bob Parsons, Ira (Russia), Anna (Russia), Vladimir (Belarus), Tatiana Koushnir (Russia, works at Coldwell Banker), Anya (russia), Darya (Russia), Katya (Russia). Ocean View Police Department was on hand to let the students know the local police aren't out to get them. A magician from Dickens Parlour Theatre was on hand to entertain the students. Students from Puerto Rico watch the magician. Students play bingo with the magician. They were to stand up and yell Bethany Beach when they won. Of course they all won at the same time. 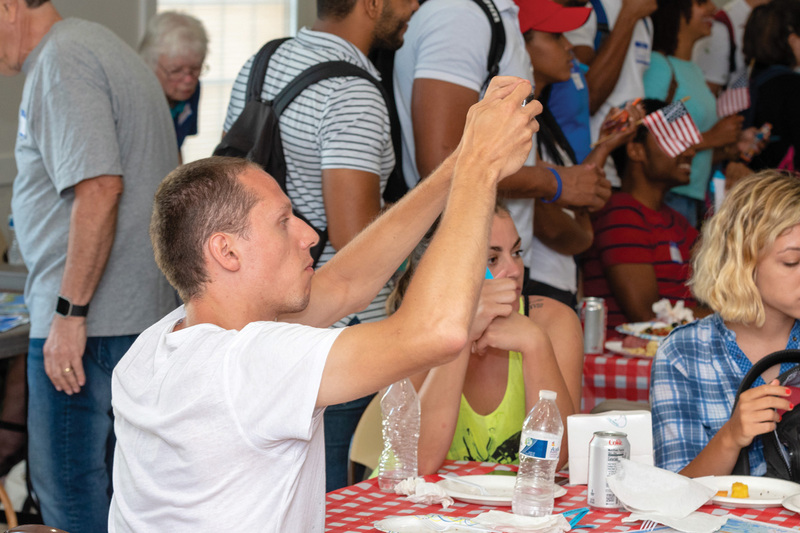 A student takes a picture during the event. 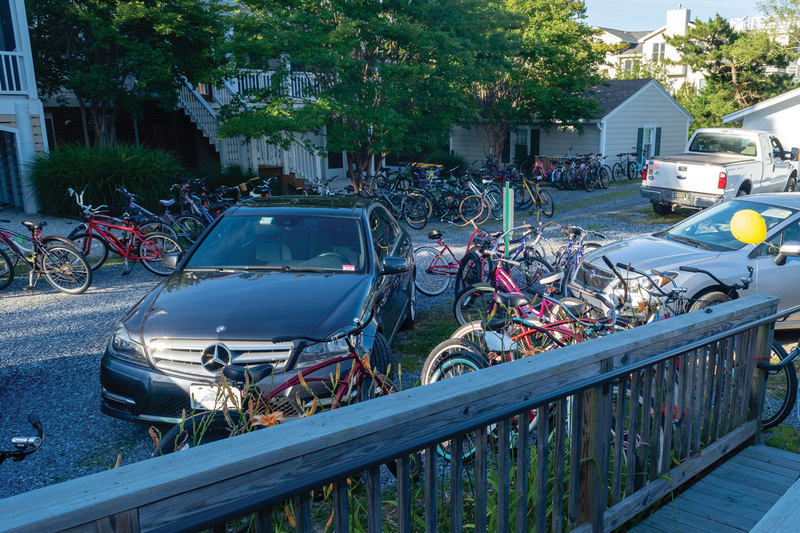 Bike lined the outside of St. Martha's Episcopal Church in Bethany Beach during the picnic. 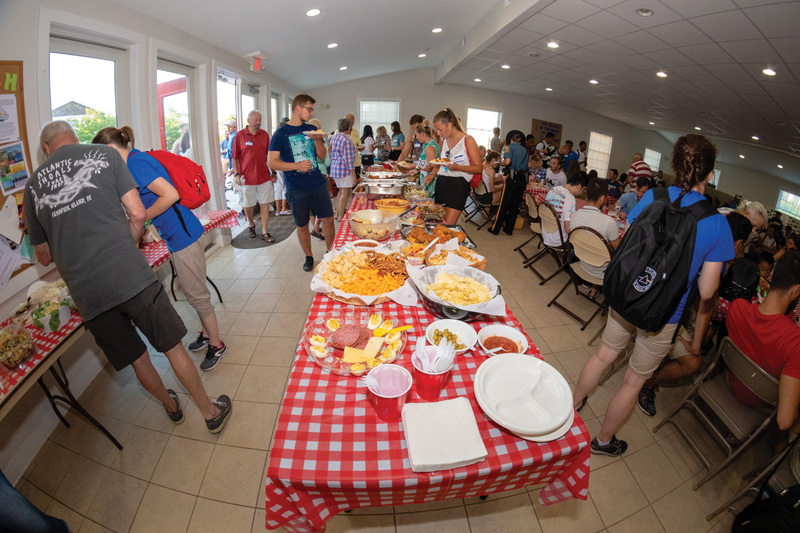 The doors to St. Martha’s Episcopal Church opened at 5:30 on Tuesday night, welcoming international student workers to Bethany Beach. 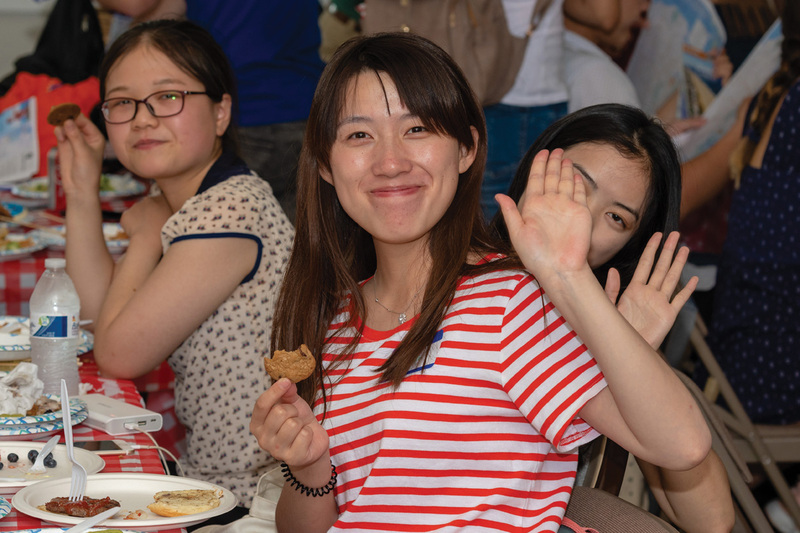 More than 100 students filled the social hall to eat, meet new people and to be introduced to American culture. Fields was quick to say that she could not have put the event together alone. Donations from businesses all over Bethany occupied the tables around the perimeter of the social hall. 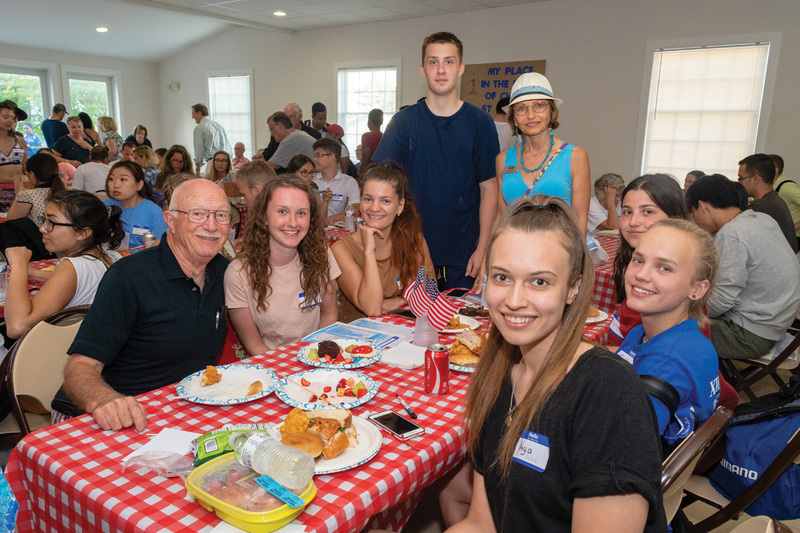 Food was donated by Bethany Beach Diner, Bethany Blues, the Blue Crab, Charlie K’s BBQ, Dunkin’ Donuts, Giant Food of Millville, Mac’s Catering, McCabe’s Gourmet Market, Ocean View Veterans of Foreign Wars, the Penguin Diner, Royal Farms of Ocean View and Subway, and by parishioners of the church. 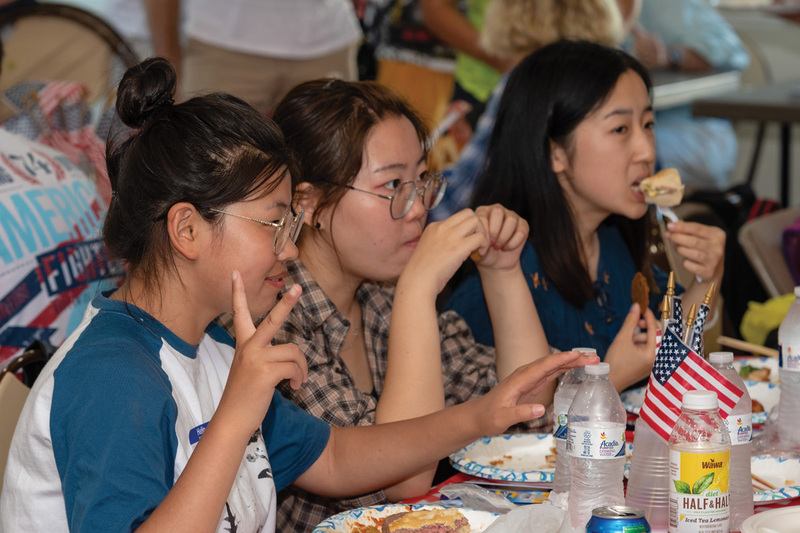 The menu consisted of traditional American foods, such as hamburgers, hotdogs, barbecue and pasta salad. Door prizes that included local logo wear and food were donated by 3 Blonde Bakers, Al Casapulla’s Subs & Steaks, Armand’s Pizza by the Sea, Ba Roo’s Ice Cream, Bethany Beach Goods & Rentals, Fox’s Pizza Den, Made by Hand International Co-Op, McDonald’s of Bethany, ResortQuest Sea Colony Gift Shop, Taco Taco and the Bethany- Fenwick Area Chamber of Commerce. Also on hand were Bethany Beach police, giving out and installing free bike safety lights, South Bethany officers giving out free safety vests, and free sunscreen from Walgreens and CVS. 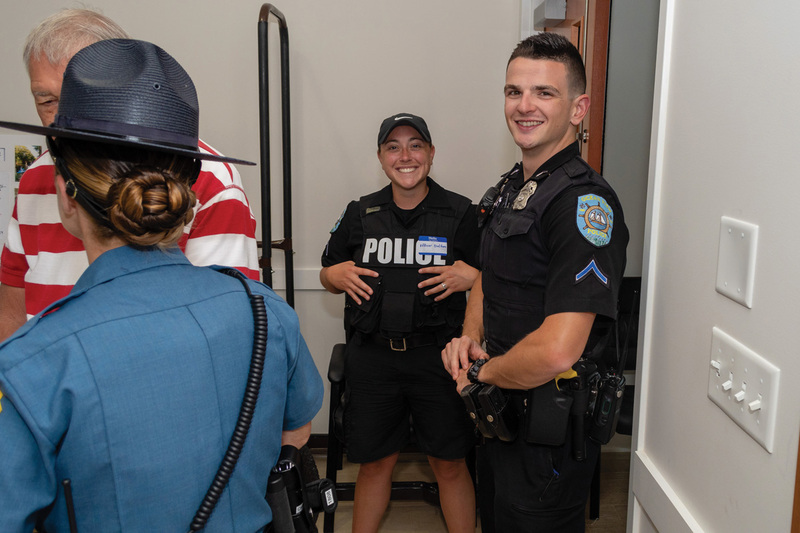 Many people were there to talk to and welcome the students, including a Delaware State Police trooper who was once an international student worker herself. When she was a student, she said, she attended the picnic and never looked back. Since then, she has graduated from Delaware Technical Community College and become a state trooper. Every year, Fields adds pieces to the picnic that were suggested in years past. 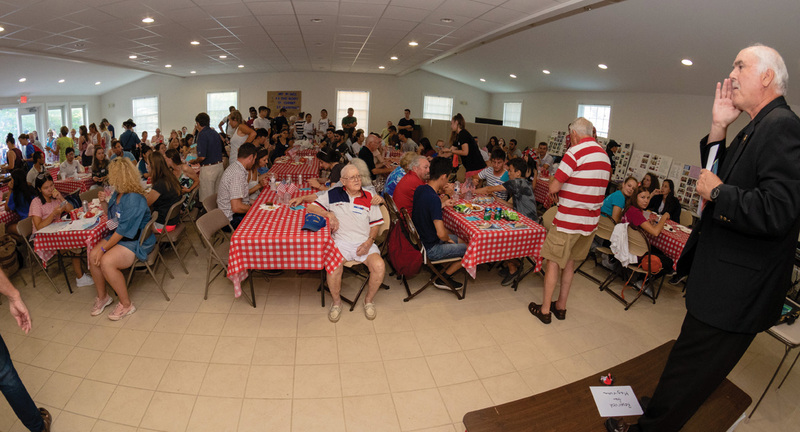 Last year, a game of chess was added, leading to the 1st Annual Chess Challenge. The 2nd Annual Chess Challenge will be held this summer. This year, American magazines were added for students to take home, read and bring back for another. Also donated to the event was a trip to Dickens Parlor Theater for a magic show, and both Bethany Beach Surf Shop and Coastal Kayak donated free stand-up paddleboard lessons. 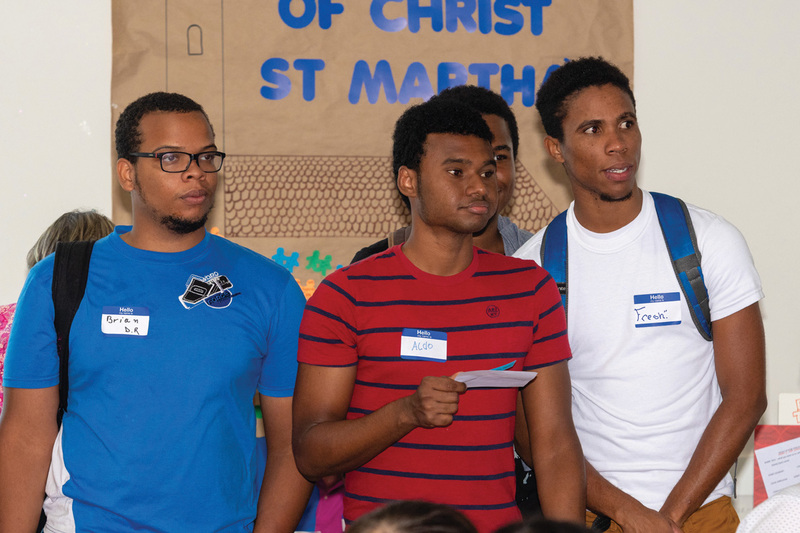 One of the most exciting events for the students is a trip to tour University of Delaware’s Engineering Labs and NASA’s Wallops Island Visitors Center. 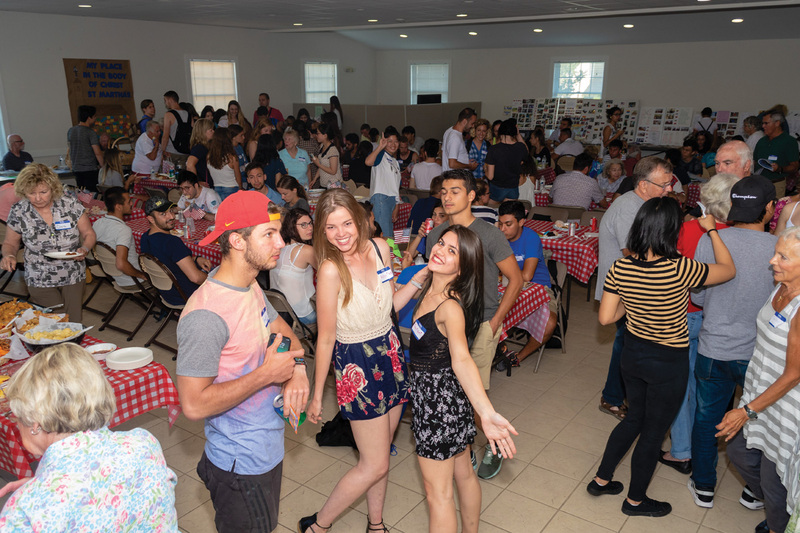 Even with all of the donations, there is one more thing that the international students look forward to the most: home-cooked meals. Three years ago, Fields and her husband, John, hosted a dinner party for a small group of students. 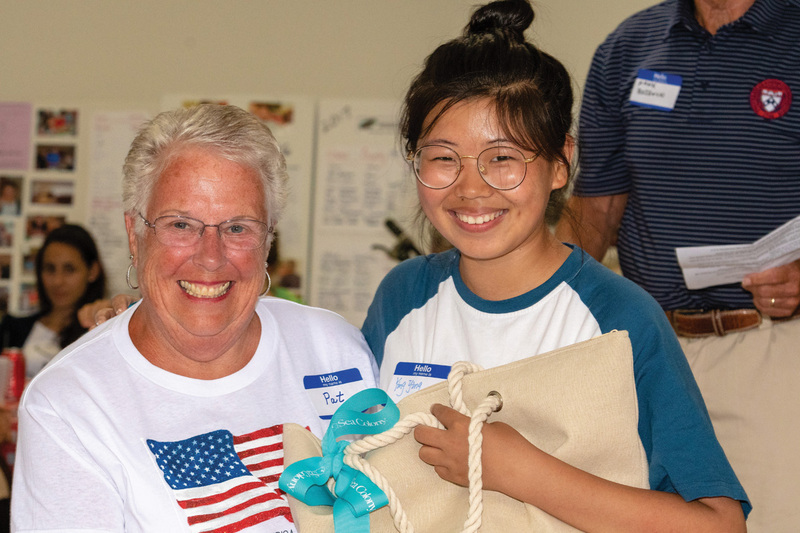 Since then, she has encouraged parishioners and volunteers to do the same. 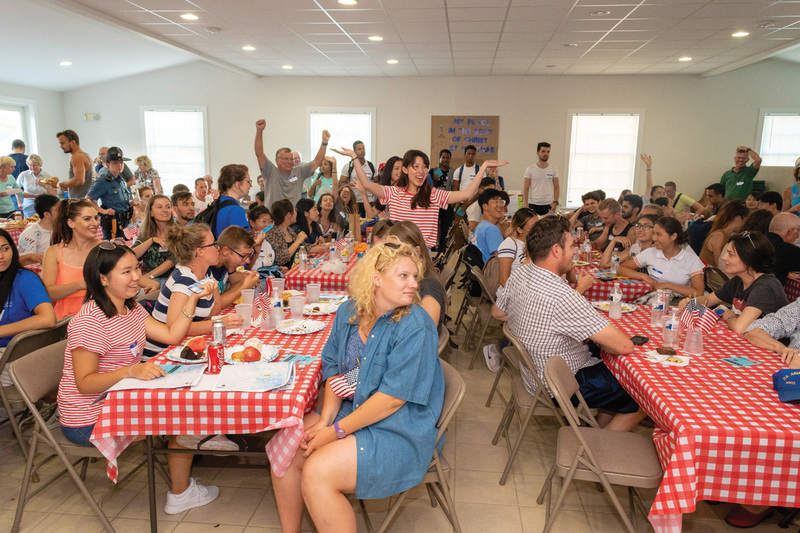 Many invite students over for dinner, where they just talk, in order to enhance the student’s English, and some people meet the student at the Bethany Beach bandstand and watch a show and have ice cream, so they can experience American culture together. 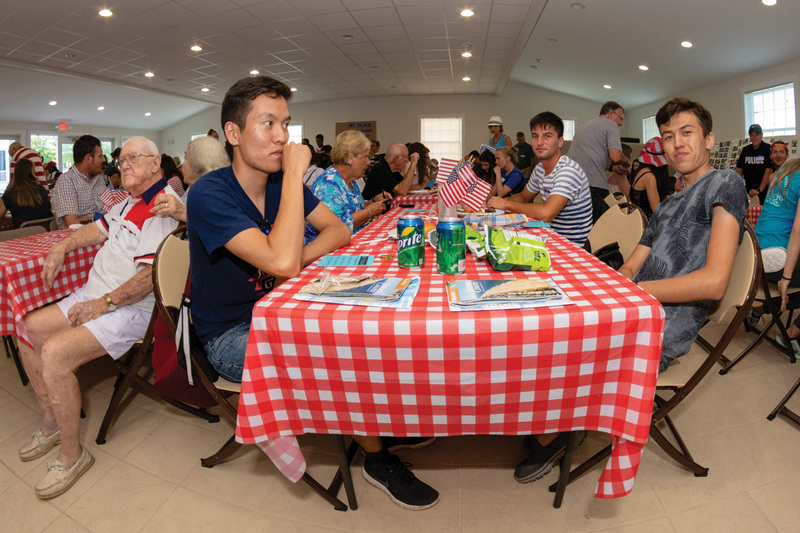 Anna Chernegova is in her second summer in Bethany and worked at the church last year. 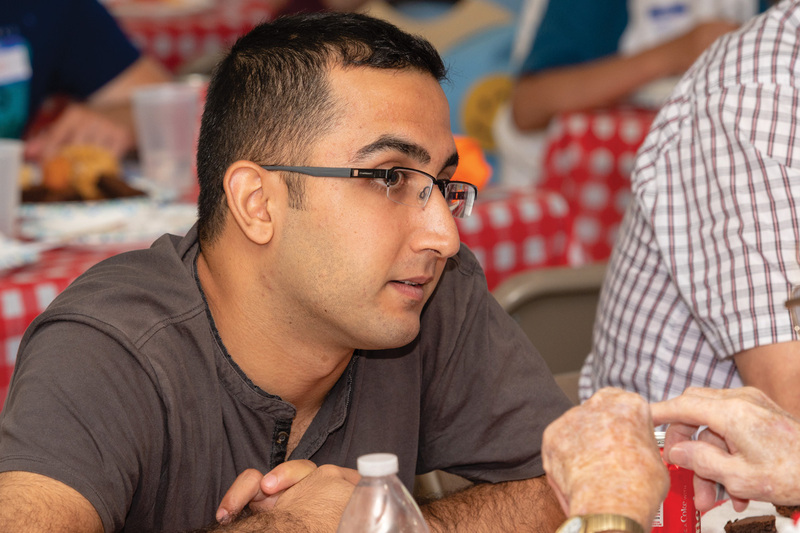 Originally from Russia, she said that she loves coming to the picnic and being able to meet new people from different countries, whose backgrounds differ so greatly from her own.